This lesson we will talk about Thai words that are used for ‘when’. We have three different words for ‘when’. It sounds like why we need to complicate things, right? Don’t worry it is simpler than you think. Just watch this video to the end and you will understand it clearly. เมื่อไหร่ /mûea-rài/ is a question word used to form any ‘when’ questions. When will you come to Thailand? 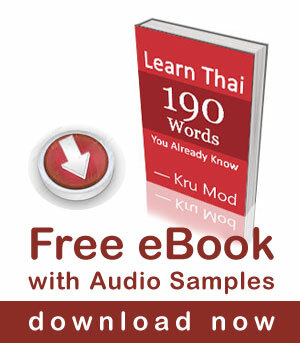 When did you start learning Thai? **NOTE: The question word เมื่อไหร่ /mûea-rài/ can also be put in the beginning of the sentence. When will you come to Thailand again? เวลา /way-laa/ is used to talk about something that is always true or habits. Similar to ‘whenever’ in English. When she is angry, she doesn’t like to talk. When it rains the traffic always bad. ตอน/dtawn/ is used to talk about one period of time or one specific event. When she was a kid, she didn’t like to eat vegetable. When we were in Thailand last year, we learned to cook Thai food. พอ /paw/ is used to talk about ‘when’ when there is one event happens right after another event. It is similar to ‘as soon as’ in English. When you arrive the intersection, turn right. Call me when you get on the sky train. The last word is ‘เมื่อ /mûea/’ this word is FORMAL. We don’t need to talk about it much because we don’t use in spoken Thai. It is used to convey the same meaning as ตอน/dtaw/ and เวลา/way-laa/. That’s it! Now you can choose the right word for ‘when’. Take your time to review this lesson and don’t be afraid to make mistakes. In some contexts ยาม means WHEN and in some other, as I understand, is equal to ตอน (at +) time (of day). ยามเช้า = at the morning. But ยาม is a formal. Sure, it is not for beginners, but can you explain? You understood it correctly. ยาม is used for “when” in the same meaning as ตอน but it is formal and sounds old fashioned. It is usually used Thai proverbs and never use in spoken Thai. Oh! that was a typo. Thank you for your correction. Good explanation ! Good teachers! Originally I just wanted to pick up a few phases for my trip to Bangkok but your lessons inspire me more than I expected. I have learn so much from those role plays and clear explanation and also found that Thai language is very charming!! Sawatdii ka Tin, thank you for your kind comments. We are happy to hear that you enjoyed our lessons and found them inspiring. Please keep learning and come back to Bangkok to practice your Thai with the locals. Does the Thai imply “again”? Does it require an “ik” (sorry, no Thai keyboard)? That’s right. The word อีก/ìik/ should be added for the word “again”. I am sorry for my mistake when writing the post. Sorry if this is nit-picky, in the example “rót dtìt = traffic is bad”, I think rot dtit is only trafficbut what is the actual translation for dta lawd? รถ /rót/ means ‘car’ and ติด /dtìt/ means ‘to be stuck’. When joing both words together you will get a sentence รถติด /rót-dtìat’ which means “the cars are jammed”. The negative sentence would be รถไม่ติด /rót mâi dtìt/ which means traffic is good. ตลอด /dtà-làwd’ means always. It is always put at the end of a sentence. thank you for this very helpful lesson. Until now I knew only Mua rai and people would tell me wella and I thought they would talk about the time!!! very confusing situations. By the way “vegetables” in most of the time a plural and a verb is missing in this sentence “When it rains the traffic always bad” 😉 . Also thank you for correcting our broken English. you mean “my broken English” 😛 ; there are a few small errors in your English besides the vegetables thing if interested? Hi, Another good post and well explained. You must be very busy as the gaps between your posts are getting longer and longer. I would like a post covering driving in Thailand, filling up with petrol,flat tyre,breaking down,dealing with the police at road blocks. Thank you for watching our lesson. We are happy to hear that you found this one useful. We would like to be able to upload lessons more frequently. Also thank you for the video suggestion. It is a good idea!